The Spokane Resource Center was in the works long before HUD labeled it an "EnVision Center." Thomas Allison hasn't worked in five years, but he needs more than a job. He also needs a stable place to live, a way to get to work and basic computer training. Last week, Allison, 60, walked into a place that theoretically could help him with all those things. It's called the Spokane Resource Center, a collection of local social service agencies all in one location in Spokane. As the city of Spokane says, it's a one-stop shop that can reduce barriers for underserved citizens. The resource center won't officially open until April 16. But as it prepares to launch, it's testing out how it will help folks like Allison, who didn't know it existed until he was referred by WorkSource Spokane located a floor below the Resource Center at 130 S. Arthur St. Allison is hopeful it will set him on a path forward. "I know a lot more now than I did before I walked through that door," Allison says. 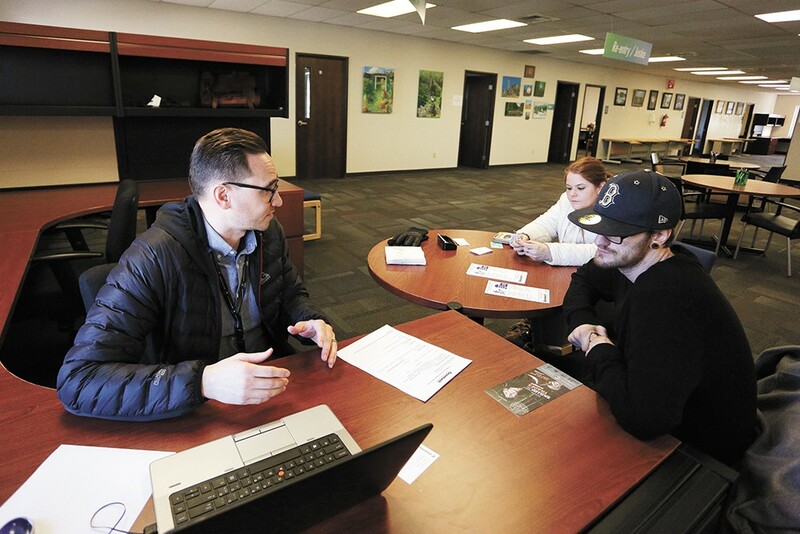 The Spokane Resource Center is among the first few of 17 so-called Housing and Urban Development (HUD) "EnVision Centers" throughout the country. While some communities are reportedly struggling to get the ball rolling on the centers, Spokane had one in the works long before HUD threw in the "EnVision Center" label. Now, Spokane's center could help serve as a model for others trying to get started around the country. But first, the city and social services partners have to figure out if it can even work. A one-stop social services site is not a novel idea. Similar sites already exist throughout the country. For example, in Redmond, near Seattle, a place called the "Together Center" aims to put an array of programs on one campus to lower barriers for those looking for help. In June of last year, HUD announced an initiative to encourage more one-stop locations throughout the country. Seventeen communities, including Spokane, would be part of the first round of what it described as one of Secretary Ben Carson's "signature initiatives" to open EnVision Centers. The label came with no funding from HUD, but the idea was to improve access to HUD-assisted services and for those seeking to "achieve self-sufficiency," according to a HUD press release. The centralized hubs would support "four key pillars of self-sufficiency": Economic empowerment, educational advancement, health and wellness and character leadership. By then, however, the city of Spokane had been working on a similar idea for roughly a year, says Alex Reynolds, community programs coordinator for the city. "I think we had a huge advantage there, because everybody else was starting from scratch," Reynolds says. The plan originally was to put it in the Intermodal Center, where the Greyhound bus depot is, but council members feared that the Border Patrol immigration sweeps of Greyhound buses would deter some from accessing services. That set the city back roughly six months, Reynolds says, before the city then identified the WorkSource building as a possible location. That ended up being a much better option than the original plan. WorkSource already had an integrated services model focused on employment, and it was a logical pairing with an integrated social services site. "The scope of what we were doing then was so much smaller than what we ended up getting into in the end," Reynolds says. Now, the center uses an entire floor that's roughly 20,000 square feet. The main room where people can seek services is around 7,000 square feet. It's an open concept, with signs hanging from the ceiling designating each pod or "neighborhood": Housing, health care, justice/re-entry, peer mentoring and employment. The rest of the floor will be used for training workshops and classes, a multicultural center and eventually a clothing closet. The sheer amount of space separates the Spokane Resource Center from other similar centers in the country, Reynolds says; some of the largest EnVision Centers have less than half of the Spokane's main room. "What we're doing is pretty unique compared to centers like that," Reynolds says. The center works with 15 different project partners, which are local organizations that meet a variety of needs. But here's another area where the Spokane Resource Center differs from other one-stop shops for social services: People don't walk in and choose which organization can help them like they're stores at a mall. Instead, the goal is that anyone who walks through the door will be greeted by someone to address all of their needs, shrinking what could have been days' worth of appointments into a few hours. It's not about enrolling into a certain organization's program, says Jennifer Morris, site manager of the Spokane Resource Center. "It's about helping whoever walks in that door," she says. "I worry that folks won't be there at the same time — that those resources won't always be available." A good example would be someone who is just getting out of prison. That person might need employment, but they may first need housing and food. The resource center could help with all of that. Morris says a few men have already told her that the resource center would have been helpful when they got out of prison, instead of having to figure it out on their own. "It's a hard thing to figure out," Morris says. "And so this is a space for that." Lee Jones, a HUD spokesman, highlights Spokane's ambition in trying to have 15 providers all working under the same roof. "That's a lot of possible things that can go right," Jones says. "And a lot of possible things that can go wrong." That's why he praises Spokane's "methodical" approach in working out the kinks before officially opening the center. One challenge for the center will be having staff there from various agencies so that each pod or "neighborhood" has at least one person there. If someone comes in for pre-employment, and nobody in pre-employment is there, then that's a problem, Morris says. "It's a hard thing, I think, that some of the providers are having: How do we have staff here, but still keep the funding streams that we have?" Morris says. Ryan Oelrich, executive director of Priority Spokane and not part of the Spokane Resource Center, agrees that could be an issue with the tight budgets of some of the partnering organizations. He says that as someone who has tried to help young people get resources they need, it is difficult when you have to set up multiple appointments. Having everybody in one place, he says, "could be really advantageous," if it actually works. "I worry that folks won't be there at the same time — that those resources won't always be available," Oelrich says. And while the organizations currently partnering with the Spokane Resource Center cover an array of needs, there are a few organizations that have been left out. Reynolds, with the city, says some organizations have already reached out because they felt like they could have been part of the center. He encourages more to do the same if they feel like they offer a service that the center is missing. "We want to hear from them," Reynolds says. "It's better to have that uncomfortable conversation than go on in our ignorance and fail to meet the needs of people in Spokane." Despite some of the questions, Oelrich is optimistic that it can work for Spokane if organizations are able to dedicate resources to the center. The original print version of this article was headlined "A Clear Vision"